The Ontario provincial government released their Climate Change Action Plan recently to the applause of many across the province, and with the rules and regulations that went into affect Jan. 1, 2017 to support the initiatives contained in the plan. The plan touches all sector so the economy – from transportation to home heating – with a goal to reduce and eliminate the carbon footprint of the entire province by greening our economy. While some hardships will be felt, the plan has been received well and the future of the construction industry will change dramatically because of the innovations that the plan will require. New technology will play a big part in the transition from fossil fuels to help the construction industry bring all Ontario homes and buildings to a net zero carbon emission release. For new homes in particular, adjustments in the building code with regard to attic insulation will be challenging, but doable. The government has mandated that attic insulation density for new homes be at an R-60 value or higher to meet the new emission targets the province has set to achieve the net zero target. For older homes and buildings, the government has provided a suite of tools to help bring energy efficiency to homeowners who may not have adequate attic insulation. In order to have voluntary compliance, the government has created a Green Bank to assist current homeowners upgrade their homes to reduce energy use through conservation. 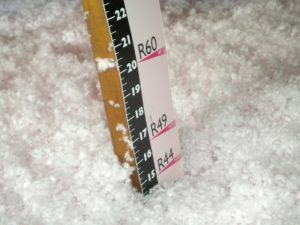 Many homes today have attic insulation that is in the R-20 range, and while some insulation is better than none, adding more attic insulation to increase your R-value to R-40, is a great idea. Experts have told us time and again that heat loss through the attic is 40 per cent of a home’s heating bill and the quickest and easiest way to save more and the environment is an attic insulation retrofit. The best insulation product on the market at this time is Owens Corning EcoTouch Pink insulation. 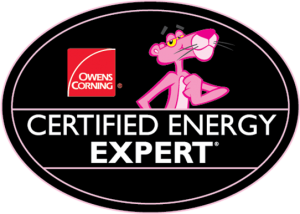 Owens Corning has been an industry leader in the field of insulation for the past 70 years and they invented fiberglass insulation in the 1930’s. EcoTouch Pink insulation is made with 73 per cent recycled materials and that means less energy to produce and fewer materials to create, a truly green product to produce green results. An attic insulation retrofit is a cost-effective way to reduce home heating and cooling bills, too. The costs of an attic retrofit to bring your attic insulation up to an R-40 density will be recovered in cost savings on heating and cooling bills over the course of a year or two as the upgrade is estimated to save approximately 20-30 per cent per year. When you are deciding how much attic insulation will best suit for your home remember that more is always better because it will only increase the amount you save on your home heating and cooling bills.